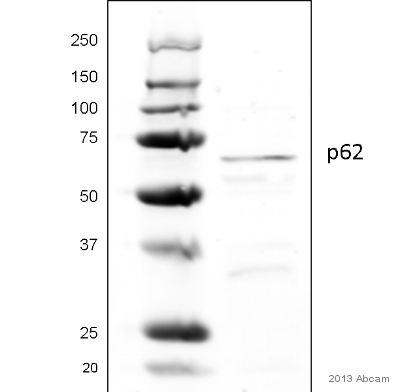 Recombinant fragment corresponding to Human Nucleoporin p62/NUP62 aa 294-502. WB: A431, H1299, PC-12, Rat2, Neuro-2a, GL261, C8D30, NIH/3T3, BCL-1, RAW 264.7 and C2C12 whole cell lysate. ICC/IF: A431 cells. IHC-P: Mouse fore brain tissue. Our Abpromise guarantee covers the use of ab96134 in the following tested applications. WB 1/500 - 1/3000. Predicted molecular weight: 53 kDa. 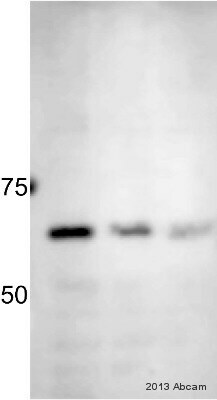 ab96134, at a 1/200 dilution, staining Nucleoporin p62/NUP62 in paraformaldehyde fixed A431 by Immunofluorescence analysis. 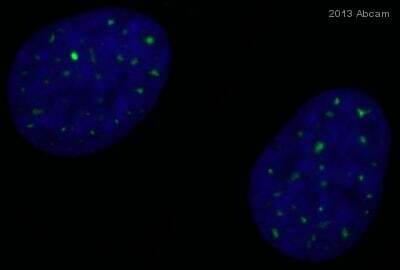 Lower image: merged with DNA probe. Paraffin-embedded mouse fore brain tissue stained for Nucleoporin p62/NUP62 using ab96134 at 1/500 dilution in immunohistochemical analysis. 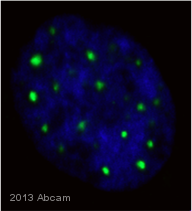 Immunofluorescence analysis of A431 cells, staining Nucleoporin p62/NUP62 with ab96134 at 1/200 dilution, demonstrating punctate nuclear staining.